Rev up your appetite because a new drive-in opened in Des Plaines! 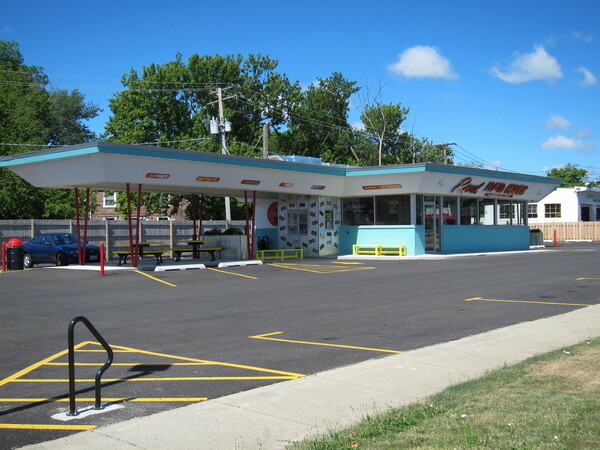 While Des Plaines has been home to a number of drive-ins, Rand Red Hots, located on 1441 Rand Road, is the only one that still resembles an actual drive-in. Rand Red Hots has a very brief menu, reminiscent of the limited-menu and fast-service model perfected by McDonald’s, whose first corporate restaurant is just around the corner on Lee Street! Rand Red Hots has given the building a full makeover with new blacktop and concrete, a rebuilt restaurant area, removed car shelters, new lighting outside, and more! Open from 11 a.m. to 10 p.m., business has been brisk in the first days. For all our Lexington Park residents, another great dining option is now on the menu!